As with any diet there are temptations. Not just with what is on your “stay away from” list, but also what is on your “eat whenever you want” list and your “okay you can have it sometimes” list. Almond flour falls into the category of “okay you can have it sometimes” for my family’s grain free diet. It is good for you. It is not so good for you in excess, as with any nuts. Regardless, it tastes good. Just like the coconut, the almond is not a true nut, but a drupe, comparable to the stone pit of a peach. It is considered a tree nut, when most people refer to tree or other nut allergies. Almonds are usually offered in nut form as whole, sliced, slivered, chopped and ground into meal or flour. Almonds are also made into a dairy milk substitute. When they are blanched they have a creamy color. When ground from their natural state, with the brown ‘skin’ on, there is a speckled look to the meal. The good thing about almonds is they are nutritionally dense, giving you a hearty boost of Vitamin E and B vitamins. Their high level of protein, fat and fiber fill you up and help level out blood sugar. The bad thing for some people is they are high in calories and fat, which, when consumed as a snack and not a primary source of protein is fine, but in excess can cause bloating and an unnecessarily high consumption of calories. A majority of the fat is monounsaturated and polyunsaturated, so if fat is to be consumed, it is not a bad nut to rely on. Almond milk is a lactose free alternative to traditional dairy milk. It is made by grinding almonds along with water, then straining the mixture to remove the nut pulp. It is often used as a one to one substitute for dairy milk. Blanched almond flour is a result of removing the brown skin from the almond. The result is a light colored, smooth flour that makes for a more delicate result when making baked goods or marzipan. Removing the skin reduces the nutritional value of the almonds. Since the skin is full of flavanoids, the skin enhances the antioxidant power of almonds. Removing it reduces the impact of antioxidants. Natural almond meal is a result of grinding the almonds with the skin on. It makes for a darker, more rough texture, which carries into any baked goods made with it. As noted above, including the skin when consumed increases the antioxidants available from the nuts. I enjoy using both blanched almond flour for lighter, fluffier baked goods, while also enjoying the use of almond meal for heartier, more dense results. The use of almonds in Grain Free Haven products is two fold. Our Momma’s Mixed Nuts include almonds, along with walnuts and pecans. A handful of the Mixed Nuts as an afternoon snack is a great way to give you a boost of energy between lunch and dinner. Almond meal is combined with coconut flour and other ingredients to make the various muffin flavors we make available each week. In comparison with coconut flour, almond meal is higher in calories, fat and protein, while being notably lower in carbohydrates and fiber. The almond meal is a great companion to coconut flour in our muffins, resulting in a quick and filling breakfast or snack. The meal and flour work wonderfully together to balance out the texture and moisture of the muffins, whether they are Banana Bread, Orange Ginger, Blueberry Lemon or Jalapeño Cheddar. This pizza crust recipe is quicker and easier than a traditional wheat flour crust that needs to rise. Considering the crust is made primarily of cheese and almond flour it is also very filling, so a person who is used to eating half a pizza in one sitting would be wise to take a break after one or two very filling pieces. My family loves making two or more pizzas on a pizza night, allowing for plenty of leftovers and all palates to be appeased. Enjoy! 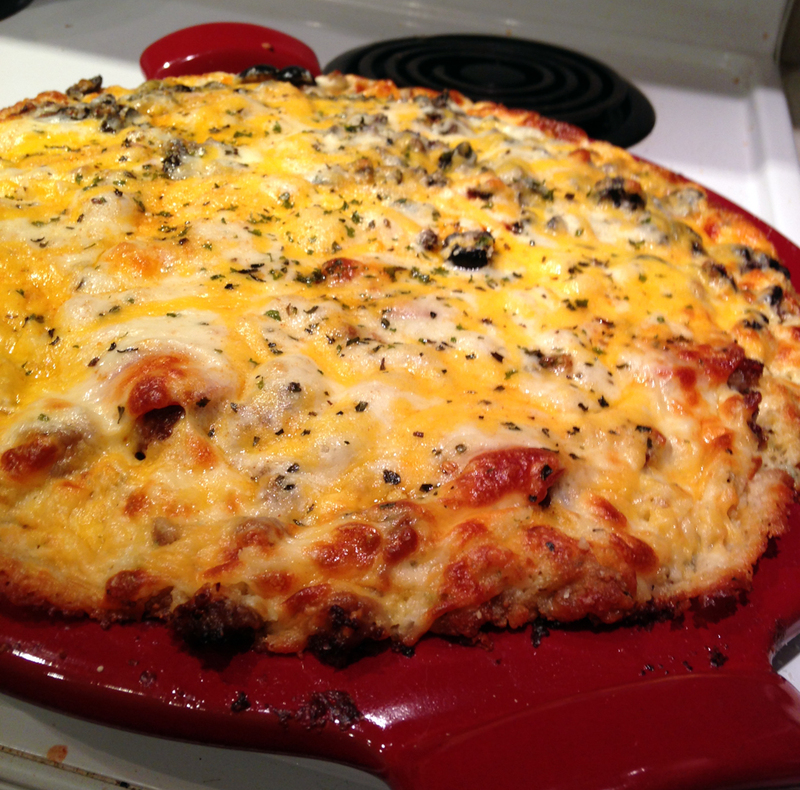 Combine in a medium bowl all crust ingredients except the eggs. When well combined add the eggs and stir with a fork until a moist dough forms. Spread enough dough onto enameled pizza stone (preheat as directed) or baking sheet to have a layer about 1/4 inch deep. Bake the crust for no more than five minutes, allowing it to set and just begin to brown. Lower oven temperature to 425 degrees. Remove crust from oven and add sauce, toppings and cheese. Return to oven and bake for 10 – 15 minutes, until top cheese is browning. Remove from oven and let cool for about ten minutes, allowing crust to set and toppings to cool. Slice and serve. Saturday, February 6, 2016, 8am-5pm: Dallas Farmers Market. It is supposed to be a little chilly, but with wonderful blue skies! Come get some more Blueberry Lemon Muffins and balance them out with spicy Cajun Cashews! I know your Whole30 January Challenge is over, but they are still delicious! Sunday, February 7, 2016, 10am-5pm: Dallas Farmers Market. Yes, there is some big game playing on the television today, but it does not start until this evening after the market closes! Come down and stock up on snacks to enjoy during the commercials and get ready for the week with some grain free muffins and bread! If you come by my booth and tell me this week’s discount code you will get $1 off any purchase of $15 or more! The code for this week is PIZZA! Please feel free to forward and share this newsletter with anyone you like! I look forward to seeing you this weekend! Come on out and enjoy the predicted beautiful weather!